I just got the cutest new stamp from Impression Obsession. This is the Blue Footed Boobie Bird and yes, there is an actual bird named that! Less is More and AAA Cards. Man, these girls really know how to torture a person! One layer with a colored cardbase! Totally not in my comfort zone! and colored with Prisma Color Pencils. called Monsters Ink by Technique Tuesday. Bar Exam. I figure she'll feel like this when she's done! Great bird, what a cute stamp, and a great card. your coloring is fantastic. He's fun - love those blue feet! Great use of that white pencil to add highlights. Thanks for playing at AAA Cards. CUTE card!!. Yes, there is such a thing as Blue Footed Boobie...I've seen while on one of the Galapagos Islands. So fun and cute, Doni. I can see why you bought this stamp. Great pencil colouring. It made me smile. Thank you for joining us at Less is More in collaboration with AAA Cards. Ha ha ha...this guy just makes me laugh. Terrific card! Love this bird, love your coloring and LOVE your card!!!! I spotted this fun card in the gallery at LIM and just HAD to come over for a closer look. 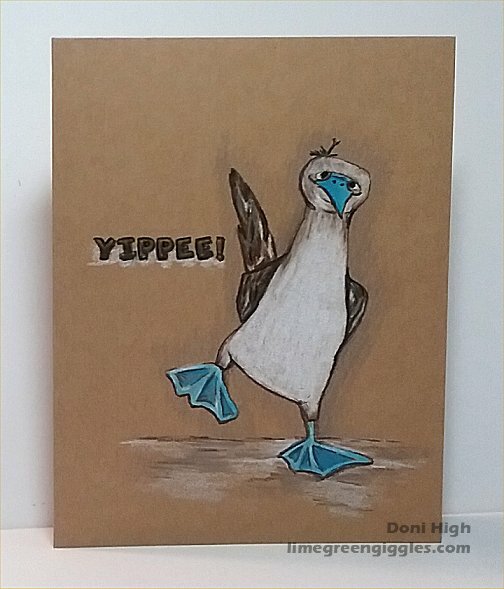 It is hilarious - I love that stamp, I had no idea there was a stamp of a blue footed booby! He is adorable! 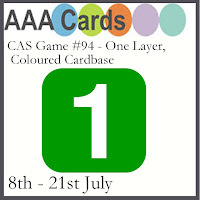 Great one layer card. Thanks for playing at AAA Cards. Oh he sure did make me smile. Such a fun and beautiful card. Thank you for sharing with us at AAA Cards.